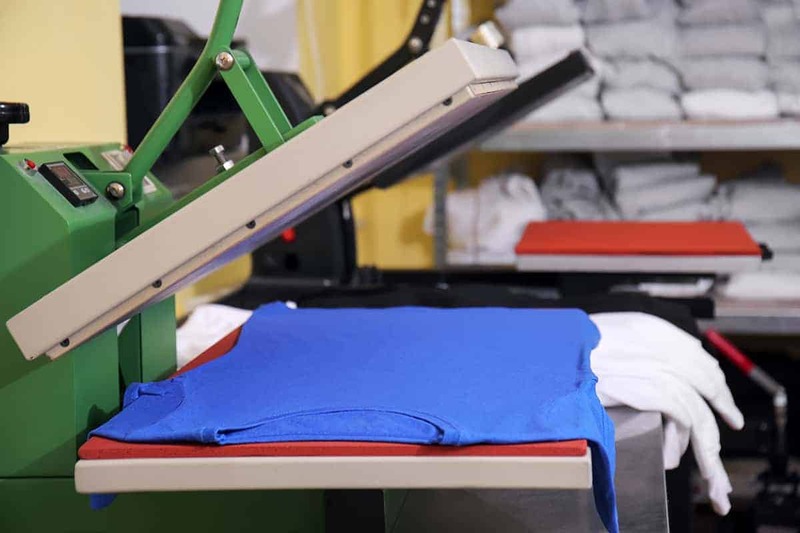 So you know you want to get started with your own custom t-shirt business, but you might be confused about whether you want to go with”heat-press printed” or “screen printed” methods. I mean, they both sound similar, and they both seem to get the job done. So what’s the difference between heat transfer vs screen printing, and how do you know which method is best for you? 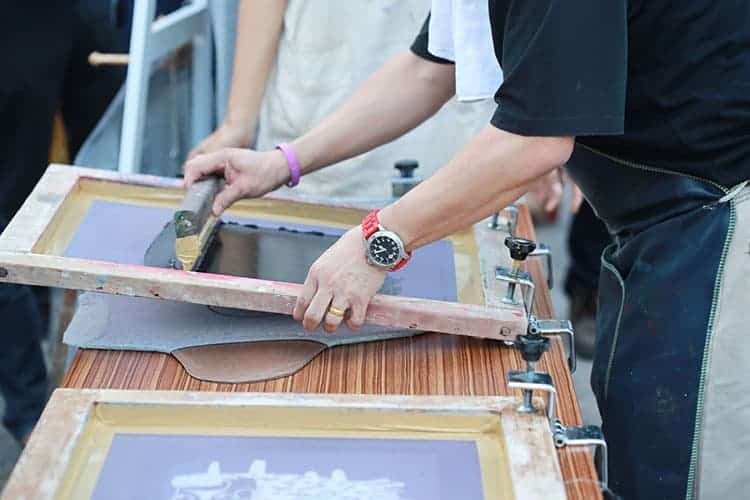 Here, in this article, we’ll break down how the two methods (screen printing vs heat press method) work and the individual advantages and disadvantages of both those types. We will also analyse the screen print vs heat transfer quality, as well as look at the cost involved. Find below a quick comparison of t-shirt heat press vs screen printing methods. You can read through our post of other types of shirt printing types here. Screen printing is done with actual screens. The screen is cut into a stencil for the design. Ink is then poured onto this stencil, which then passes through the empty spaces in the stencils onto the fabric underneath. You can only use one color of ink per screen. So if the design is multicolored, you need separate screens for each of the colors. As a result, it might take some time, if the design is complicated. Heat pressing involves the application of designs on pieces of fabric by using a combination of heat and pressure. The two most common forms of heat press printing are vinyl heat transfer and digital print heat transfer. In the vinyl heat transferring method, a machine is used to cut out designs, letters or logos in pieces of colored vinyl. A heat press is then used to transfer each of these vinyl pieces on to the t-shirt fabric. This is mostly used for logos, numbers and brand designs on t-shirts. Think of football jerseys. The logo or the letters are a separate layer on top of the shirt. In digital print transfer, the design is first printed on a special heat transfer paper using a solvent ink. When a heat press is used on this special heat transfer paper, the ink passes through the paper onto the t-shirt below. 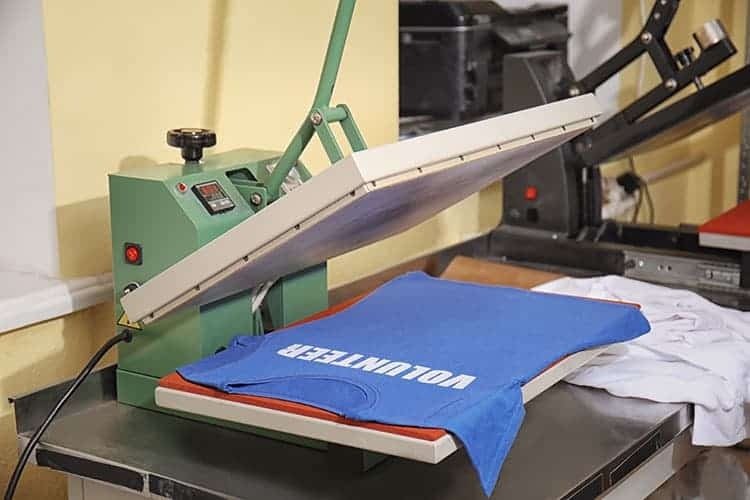 In both these methods, a heat press machine is used to transfer the design, either on vinyl or digitally printed onto the fabric of the t-shirt. It’s the combination of heat and pressure which makes this happen so efficiently. So now, that you know how both these methods work, how do you decide which is the best method for your needs? Well, it has to do with the complexity of the design, the number of shirts you need printed and the material of the t-shirt fabric (cotton or polyester). If you take a look at all the advantages and disadvantages of both these methods, which I have listed below, you’ll know exactly which one is the right fit for you. Quality – If you use high-quality inks, the ink will get absorbed deep into the fabric and will give you a vivid and bright design which looks great. The ink looks thick and makes for a great finish. Durability – Designs made using screen printing are highly durable and will last you a long, long time. Compatibility – It is compatible with most fabrics, once you use the right combination of colors and screens for your choice of material. Speed – Once you set up the design, you can print hundreds of t-shirts with the same design at a lightning-fast pace. It tends to get a bit messy when doing screen printing with all the ink and the screens. There’s bound to be some spillage and a few stained hands and fabrics. The more colors your design has, the more screens you need and the more costly it is going to get. It’s a lot easier to print multi-colored designs with the heat press system. You can even heat press photos onto your fabrics. It’s a lot less messy. All you need is a heat press machine and the design is done either digitally or is cut out of colored vinyl papers. It’s super affordable. It’s the same process, and the machine does most of the work. Hence it’s really affordable. The quality of the designs and the final finish don’t quite have the color, crispness or contrast of screen printed shirts. Colors fade away after a few washes. Longevity isn’t exactly the strongest suit for a heat-pressed design. So what’s the most cost-effective choice? So let’s compare the cost of screen printing vs heat transfer press. If your design isn’t too complex, then both heat press and screen printing will be able to do a pretty good job. When that’s the case, it all comes down to how many shirts you need printed. For bulk orders, (let’s say 500 shirts) of varying designs, we would prefer screen printing. That’s because you need separate screens for every color on the design. Hence it will be more cost effective on bulk orders and not on 5-10 shirts. In contrast, the heat press method is the same, for every order regardless of the design. So, you can do short orders without incurring ballooning costs. 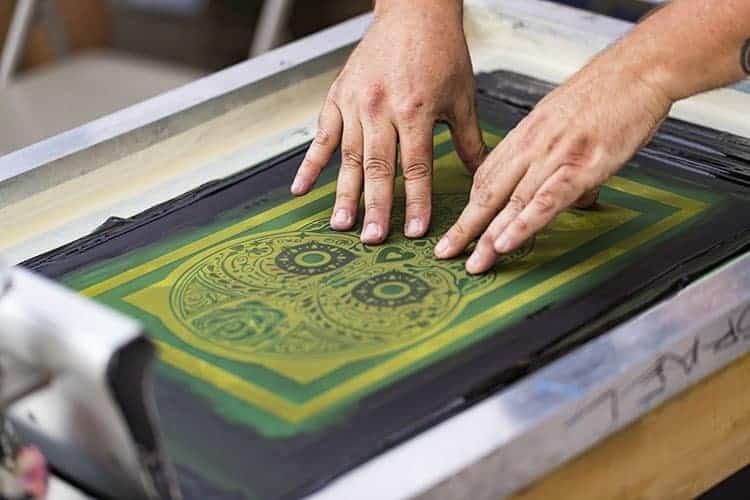 For complex designs, with a lot of intricacies and tiny details which need to be brought to the highlight, screen printing is a much better choice as each ink color is individually poured which settles down deep in the fabric, creating a vibrant display. Still confused? Here is a helpful video from Stahls that looks at these in more depth. Well, that’s it from us! 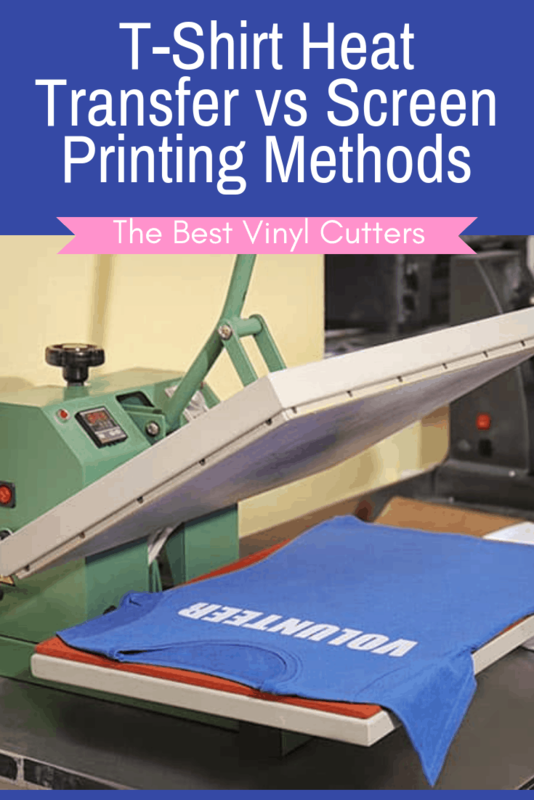 I hope this clears up all your questions about the different methods of printing t-shirts. Let us know if you have any more doubts.